This map contains territory of Russia. Displayed large city Irkutsk presented. city Shelekhov free download. town Meget free download. You can find here town Khomutovo free download. On this map town Oyek for Garmin. Zuy for Garmin. On this map Zherdovka marked. You can find here Zakhal for Garmin. Yershi free download. Yelovka for Garmin. 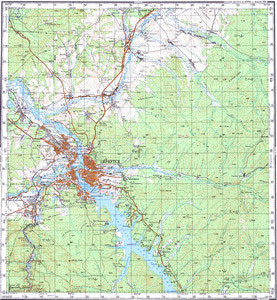 On this map Yegorovshchina download for free. You can find here Ust'-Kuda free download. Ust'-Baley free download. Urik for Garmin. On this map Tikhonova Pad' presented. You can find here Smolenshchina free download. You can find here Shiryayeva free download.